A group of Carrboro residents say they aren’t going to let their only locally owned newspaper go down without a fight. After the Carrboro Citizen stopped publishing on Oct. 4, Randee Haven-O’Donnell formed the Friends of the Citizen with the goal of reviving the paper. Haven-O’Donnell says the group first met in August when publisher Robert Dickson announced plans to sell the paper. “We had an initial game plan the first time we met in August, but last night was when we really started to map a way forward,” she said on Wednesday. The initial planning group includes Bob Saunders, Allen Spalt, Jock Lauterer, Connie Cohn, Sally Robertson, Julian Sereno, David Jessee and Peter Lee, said Haven-O’Donnell. Allen Spalt, a former Board of Aldermen member who is now retired and a member of the Friends, says the group’s goals have changed since first meeting in August. The Friends of the Citizen are dedicated to the proposition that Carrboro deserves and needs its own locally owned, independent community newspaper/website. The Friends of the Citizen are inspired by the legacy of the Carrboro Citizen, which from 2007-2012 set the standard for relentlessly local news coverage of Carrboro and surrounding areas. The Citizen published its final issue on Oct. 4, 2012. To relaunch this publication in spring 2013, time is of the essence. 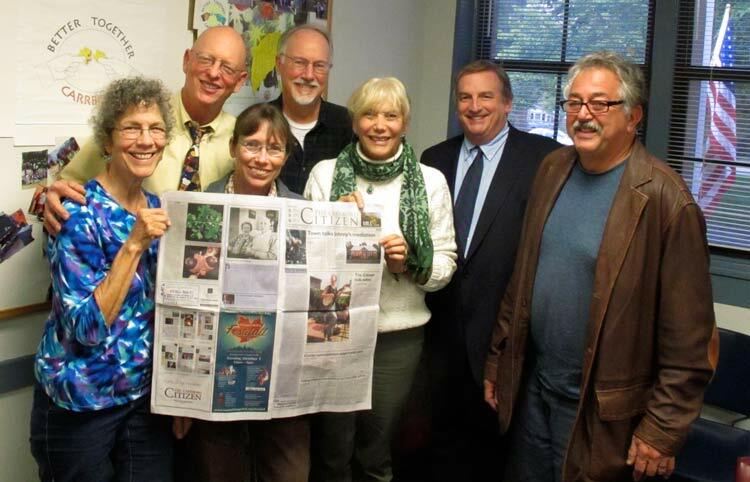 The Friends of the Citizen have taken steps to launch a community-owned nonprofit, self-sustaining, newspaper/website. We have filed for 501c(3) status to enable us to pursue community support of a newspaper that recognizes the value of relentlessly local community journalism. The Friends anticipate 501c(3) approval by spring 2013. In the short term, the Friends seek a nonprofit fiscal sponsor to serve as an administrative umbrella that would allow the Friends to secure nonprofit funding and community support. Peter Lee, who works in Information System Support at UNC Physicians and Associates and is member of the Friends, says the group wants the paper to operate as a nonprofit because it will allow them to look into sources of funding beyond advertising. The group is also considering other methods of funding, including optional paid subscriptions and a community-owed model. “The traditional route for non-profits is to rely on philanthropy—individual donors with deep pockets—and foundations who care about great journalism,” says Jock Lauterer, a senior lecturer in the School of Journalism and Mass Communication at UNC-Chapel Hill and a member of the Friends. Lauterer says that the idea of operating as a co-op is suited for a town like Carrboro that celebrates local innovation and thinking outside the box. Former publisher Robert Dickson, who plans to keep the Citizen’s archive site open, says he thinks there is potential for the Citizen to exist as a nonprofit. Julian Sereno, the editor and publisher of the monthly Chatham County Line and a member of the Friends, says he is interested to see if the nonprofit model could work for other papers. The biggest obstacle in the upcoming months will be time, says Haven-O’Donnell. It usually takes six months to achieve nonprofit status. Haven-O’Donnell says the hiatus will also make it difficult to retain the original staff. “We would love to be able to capture the Citizen staff before they get out to the four corners of the world,” she says. Sereno says he agrees that time will be of the essence for the Friends. Susan Dickson, the former editor-in-chief of the Citizen, says that while she is happy to provide information and insight to the Friends, she isn’t sure how she will stay involved in the future. Robert Dickson says he does not plan to return as publisher, but that he would be glad to serve as a consultant. The Friends agree they want to keep the paper in print and online but have not decided on what the paper will be called, says Lauterer. The group is also in the process of finding a nonprofit sponsor to with whom to partner while they wait for their 501(c)3 application to be reviewed. While many of the specifics are still up in the air, Haven-O’Donnell says she is certain she wants the paper to stay free. Keeping the paper free also increases circulation, says Lee. Tim West, a Carrboro resident and Citizen reader, says he is excited about the possibility of a new Citizen. Lauterer says the process of reviving the paper won’t be easy, but he’s confident the Citizen isn’t done yet.